Detailed review of bareMinerals True Oasis Oil-Free Replenishing Gel Cream. See what real experts and actual users have to say about this moisturizer. I found this moisturizer to be pretty average, so I ranked it 2.5 out of 5 stars. bareMinerals True Oasis Oil-Free Replenishing Gel Cream has some positives, but it also has some negatives. To start off, I really like the texture of it, it goes on nice and smooth. It also smells really nice; light and fresh. This gel cream has some ingredients that I love, such as Algae Extract, Peptides, Ceramide, and Amino Acids. My short term results were great, my face felt and looked moisturized. However, the longer I used this cream, the less I liked the results. It started breaking my skin out after a few days, I had whiteheads all along my jaw line. So those of you who have acne prone skin, beware. I also felt like this product never dried once I applied it, it felt tacky for hours on end. Which made it difficult to wear under makeup. In my opinion, this is definitely more of a nighttime moisturizer. It also never helped with my fine lines and wrinkles when I was hoping it would. The price point is a little higher than average, but it’s not the most expensive moisturizer I’ve seen. So overall, I gave bareMinerals Gel Cream 2.5 out of 5 stars. This product is a “gel cream”, and that’s exactly how it feels. It has the slick texture of a gel, but it’s also a little creamy and milky. It has a pretty thick consistency, but once I actually felt the product it felt weightless, and not like a heavy moisturizer. bareMinerals True Oasis Oil-Free Replenishing Gel Cream is pretty easy to apply, and I found that a little bit goes a long way. This moisturizer is packaged in a jar, like many moisturizers are. I personally don’t care for jars, because I feel like it’s not the most sanitary way to package a cream (dipping your fingers in there daily just kind of grosses me out), but it does make sense for moisturizers to be in a jar for easy application. This cream is on the thicker side, so I didn’t need to worry about it running or dripping all over, it held it’s consistency nicely during application. To apply it I just dipped my fingertips into the jar, and I usually took about 3 dips for each application (both cheeks, and my forehead). It spreads on very smoothly and blended into my skin nicely. I felt like this product never completely dried on my skin. I used it both morning and night (per the directions), and during the day it felt tacky on my skin. I was disappointed that it never seemed to fully absorb into my skin. It didn’t feel greasy, but it definitely felt ta little sticky under my makeup. This one smells amazing. It had a VERY light scent of eucalyptus or some kind of essential oil. It reminded me of a spa, and I loved how delicate the scent was on my face. I also like that the scent they use is naturally derived! When I woke up the morning after using bareMinerals Oil-Free Replenishing Gel Cream, my skin looked really good. My pores looked a bit smaller, and my skin looked refreshed. My skin felt soft and moisturized immediately after using this. I wasn’t as impressed with the long-term results. After a few days of use I got a few acne breakouts. I was getting whiteheads all along my jawline, which is never pretty. I was frustrated with this because this product is supposed to be good for acne prone and oily skin, but for me it wasn’t. So be careful with this one if you have acne prone skin. It did hydrate my skin, but I think it was hydrating in a way that clogged my pores, which isn’t good. I also didn’t really notice any difference in my fine lines and wrinkles. As far as ingredients go, this one has your standard list of conditioning agents, and preservatives in it. One of the natable ingredients in here is Algae Extract. Algae Extract is known for it’s hydrating properties, and it’s also said to instantly soften the skin. I really love this ingredient. This moisturizer also contains peptides, which are great for stimulating collagen, and conditioning your skin. The peptides in this particular cream are packed with amino acids, that help prevent your skin from breaking down, thus preventing wrinkles and saggy skin. I really love peptides and amino acids in my moisturizers as well. Ceramide NP is another notable ingredient. Ceramides are naturally found in skins outer layers and are said to be a key component to improving dry skin. I also like how bareMinerals Oil-Free Replenishing Gel Cream has a natural derived fragrance in it. I prefer natural fragrances over synthetic ones when I’m applying them to my face. bareMinerals True Oasis Oil-Free Replenishing Gel Cream Cream is $18.82 per ounce, which isn’t the most expensive out there, but it’s also not considered “cheap”. Yes, depending on where you purchase your product. If you purchase through bareMinerals, you can return the product within 30 days for any reason. That’s a great guarantee! 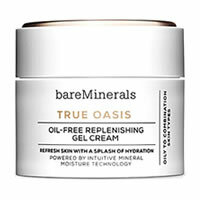 To buy bareMinerals True Oasis Oil-Free Replenishing Gel Cream, click here.